The DK Human Body iPad app is a must-have for parents, teachers, and students to explore and examine the complex, intricately designed bodies we inhabit. This Webby Award winning iPad app is filled with precisely-labeled, vibrant illustrations and informative, accessible narrative descriptions of everything from your neurons to your epidermis. The DK Human Body iPad app opens to a matrix-style screen with a torso and the highlighted aspects of each system. For example, the nervous system shows nerves swerving in and out a head and spine. The lymphatic & immune system shows the glands, nodes, and fluid pathways. You select one of the systems with a touch on the screen: integrated body; skeletal; muscular; nervous; endocrine; cardiovascular; respiratory; skin, hair and nails; lymphtatic and immune; digestive, urinary; and reproductive. You can also move back and forth between the systems by touching the bottom of the screen, and the bodies slide onto the lower part of the screen for selection. When you select a system on the DK Human Body iPad app, the quantity of information combined with the fantastic interface is absolutely impressive. A narrative with overview information of the system slides on and off the side of the screen with a touch. The skeleton with all of the relevant parts are labeled, and narrative details are available for some of these items with a touch. You can check out the 360 degree views with a responsive gesture control. A new screen with profile, front, and back views fill the screen. Where the DK Human Body iPad app takes it to the next level is the information accessed by touching the body part on the right side of the screen. Different body parts and biological processes to learn about how they relate to the system of the body you’ve selected are available. Using gesture controls, you slide your finger across the screen and touch to select a topic to explore. For example, when you are exploring the nervous system, you can learn about vision, nerves and neurons, memory, thought, and emotion. The detail is shocking, but the interface of the DK Human Body iPad app makes it easy to dig into and out of details with intuitive navigation and interface. The DK Human Body iPad app has striking visuals, intricate labels, and narrative details to illustrate and educate you in incredible detail. 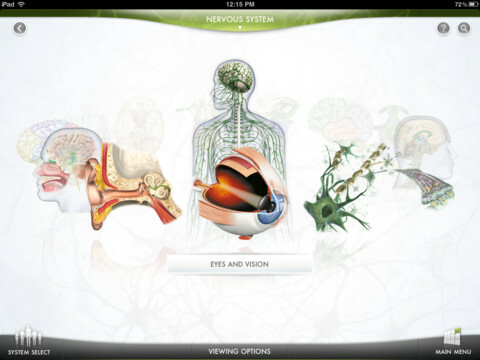 The DK Human Body iPad app is a perfect classroom tool and homework tool. At $6.99, it is a more expensive iOS app. However, when you consider the cost of a comparable book or your child failing biology, it seems like a steal. The DK Human Body iPad app is an exciting avenue for educating ourselves and our kids with iOS apps. AppSafari review of DK The Human Body App was written by Jenni Ward on July 2nd, 2012 and categorized under App Store, Education, Featured, Health, iPad apps, Kids, Reference. Page viewed 4521 times, 2 so far today. Need help on using these apps? Please read the Help Page.